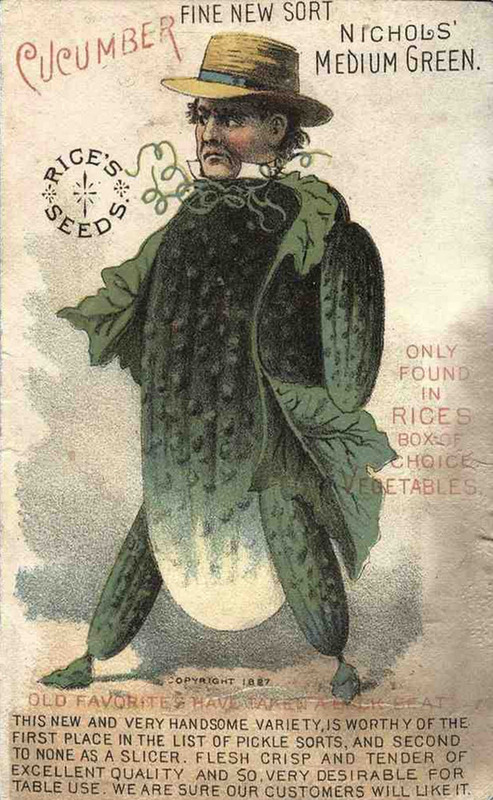 Just in time for this 1887’s growing season, we present to you a Fine New Sort of Nichol’s Green Cucumber. It is found exclusively in Rice’s Box of Choice Vegetables! This new and very handsome variety is worthy of the first place in the list of pickle sorts, and second to none as a slicer. Fresh crisp and tender of excellent quality and so very desirable for table use. We are sure that you will love it. Every cucumber comes dressed in a stylish hat. Styles will vary. The only draw back is that each mutated cucumber beast also has tiny legs that may make it hard to catch them. Also you can’t be too squeamish about the head. They tend to complain a bit when you slice them, but the taste is worth it!